Ayurveda's preferred liver and gall bladder decongestant. Doshas (constitutions): Balancing for Pitta and Kapha, may increase Vata. 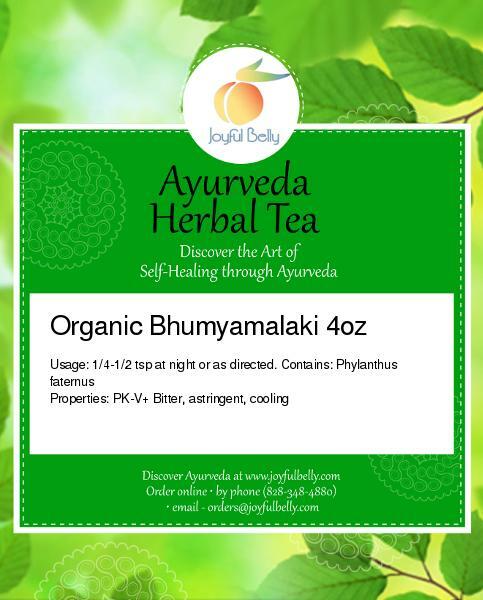 Bhumyamalaki is the quintessential Ayurvedic herb for the liver. It is very bitter in taste and has an action that is cooling, soothing and cleansing. With its special affinity for the liver, bhumyamalaki acts to cleanse, detoxify and strengthen this essential organ. It also supports proper function of the gall bladder and promotes healthy skin. An excellent herb for both Pitta and Kapha, bhumyamalaki is useful for those with constitutions that would benefit from its dry and light qualities. 1/4-1/2 tsp in hot water at night or as directed by your practitioner. How should I take my herbs? This product contains loose herbal powder for the freshest and most potent results. 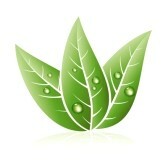 An organic cotton tea bag will be provided with your order to strain your herbs for enjoyable drinking. Your order will contain about 60 servings, 1/2 teaspoon each. Bhumyamalaki may be beneficial for these symptoms. The suitability of any product for a condition is highly dependent on the individual. Please see your doctor before using this product to treat a medical condition. Cholagogues stimulate the release of bile from the gall bladder for improved digestion. An herb that strengthens and nourishes skin, improving tone, color, moisture and complexion.